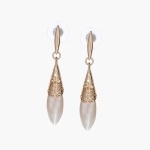 Adorn yourself with this lovely pair of earrings. Featuring a teardrop-shaped pearl, it exudes a classy look. It is fashioned with intricate details on the dangler that enhance its charm.